In mid 2007 I began to feel really exhausted and unwell, I had been working long hours in a stressful job as a senior officer in the fire service, we were in the midst of moving house and my wife was in the late stages of pregnancy, so I thought it was just stress. Shortly after our daughter Jessica was born, I became so exhausted and felt really nauseous and confused. I felt so unwell that I was unable to go to work and went to see my Dr. She did some tests and found that my blood counts were low but felt this was likely due to a viral attack. Over the following months I became more unwell as I suffered from repeated viral attacks, these left me confused and exhausted. In fact it got to the point that I was having to crawl upstairs, as a 36 year old firefighter I felt that something was seriously wrong but I trusted the Dr’s view that it was now chronic fatigue syndrome caused by all the viral attacks. I had moved Drs then and was getting a blood test every few weeks, he was unhappy about my results and referred me to a haematologist. They agreed that it was probably a virus and chronic fatigue syndrome, indeed it was but I was soon to find out why. Over the following months, I was tested for lots of different viruses or conditions but with nothing definitive being found. My GP had allowed me to return to work but he was unhappy that my blood was not improving and that I was still very weak and exhausted. He suggested that I ask for a bone marrow biopsy, I did this and the specialist agreed that, having exhausted other options, it was time to go for this option. Even at this point and after 9 months of feeling really ill it never occurred to me that that I was facing a life-changing diagnosis. The results came back and I was told in a very matter of fact way that I had a blood cancer. I was told that I had myelodysplasia (MDS) and that the average life expectancy for my condition was three and a half years. So here I was sitting in a room being told I had a condition I had never even heard of, in truth I didn’t even really know what a blood cancer was and had certainly never considered I might have it! I remember clearly the specialist saying that what would happen is that I would get worse over the next few years and in two years time I would get a lot worse and then they would need to try a stem cell transplant. I wasn’t given a leaflet or information or referral to a patient support group and therefore ended up heading to google…never the best idea, unless the objective is to terrify yourself. Over the next few months, I had to fight my case with both the specialist and the fire service to be allowed to go to fires again. Although all my blood counts were out of normal range, my biggest problem was with my immune system and this meant that I had to be very careful around infection and exposure to bugs etc. In addition because the average age for diagnosis with MDS is 71 it was really hard to get accurate information about what the future would look like for me. In point of fact, it was hard to get any information about MDS and everything I read was absolutely terrifying. My health actually got slowly better as I recovered from the chronic fatigue syndrome but I still felt awful and each day was a struggle. I had a new baby, had just moved house and if I couldn’t go to fires then I would no longer have a job, when I said that initially to the specialist they said that I had bigger problems to think about...in my head, I really didn’t. Thanks to the service doctor I was able to present a case that allowed me to return to full duties. 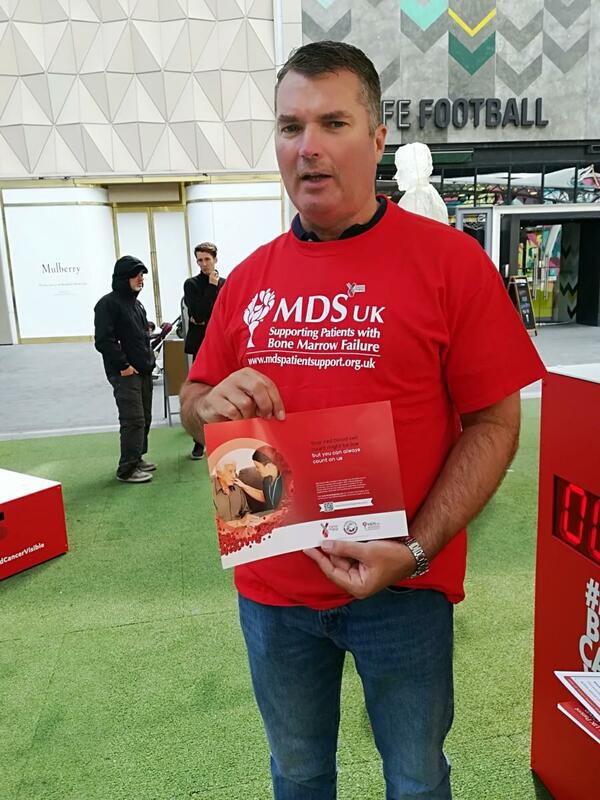 I found the MDS UK group and along with reading the huge amount of information they had, I was able to read of other patients experiences through the patient forum (this is now supplemented with an excellent Facebook support page). I saw that they had a patient support meeting in Edinburgh so my wife and I went along. The information that was provided was fantastic and gave me a lot of confidence…by that I mean confidence to ask more of the haematologists and to challenge them to ensure I was getting the appropriate support. I insisted that my case was discussed with a centre of excellence as this was emphasised by MDS UK. This really helped as through contact with Professor Bowen (then at Dundee) and he supplied a study of MDS in patients under 50 which suggested a better prognosis, with life expectancy closer to eight years. It also gave reassurance to the haematology dept that they were following the best course of action with watch and wait. There is no cure for MDS but a stem cell transplant is potentially curative and therefore I learnt a great deal about this process and as a result established a partnership between the SFRS and Anthony Nolan (more of this in the attached word document below). MDS is a progressive condition so each year it became harder to keep working, especially after fighting seasonal bugs during the winter period. I had a couple of periods off work due to ill health but it really was a battle to keep working. I have a permanent splitting headache, feel nauseous all the time, ache in the glands in my armpits neck and groin and really struggle with periods of indescribable exhaustion so you can imagine how hard it was to do a stressful job (I was a Commander in charge of a large area) and be on call for fires on top of that. But I managed and was eventually able to get people to see beyond my condition, I was even able to get promoted. In 2014 I had been off for a while and battling to get back to work but was working for one day and then going to bed for two and it was just unsustainable. At this point the specialist said that my blood counts were dropping and that I really needed to retire...although they had been telling me this for 6 years it was clear that this time they really meant it. I was utterly devastated as I loved my job, in fact it was harder to tell the Chief that I had to retire than it was to tell my parents I had cancer. In fact four years later I am still struggling to come to terms with no longer being a firefighter. This had a massive impact on me, not only psychologically but also in terms of income and my ability to support my family. Although I was extremely lucky to be in an occupation that provided an ill health pension, it was nowhere near my income, or indeed the pension I had been paying towards my entire career. We therefore lost half of the household income which is something that will always provide a significant challenge. However, I didn’t half to sell the house which I would have had to if I was in a job without the excellent protection and support offered by the fire service. Retiring may still hurt, but there is no denying that it has helped me manage my symptoms and has most likely extended my life. I still feel awful all the time and only have a few hours of energy each day but I know that I am lucky because I am not in need of a transplant yet and my red blood count has held so, unlike a lot of MDS patients, I do not need regular blood transfusions. Even so, I find that each day is a real struggle and that it doesn’t take much for me to be laid up for a few days. I am a positive person and find that I always put on a front for others so that they don’t worry but the truth is I am terrified about what lies ahead...I feel so ill all the time and I know that a lot worse is to come, I also know what the odds are around survival and have seen a number of friends pass away due to blood cancer. You would think after 10 years I’d be used to it but it actually gets harder each year as I see my quality of life diminish. What I do though is to try and use my story to highlight blood cancer and the challenges faced by patients and in particular the need for stem cell donors. I volunteer for the Anthony Nolan Partnership that I established but each school visitor being in public areas leaves me very tired and sore the next day. It is incredibly frustrating, particularly because like a lot of blood cancer patients I look ‘well’ indeed often the days I feel my worst I look healthier. I also still find that most people don’t realise how many blood cancers there are and how each case is very individual to the patient. I’ve no idea what lies ahead but I have faith in all the incredible advances being made by drug companies and researchers as they get closer to finding more different treatment options and hopefully one day a cure. 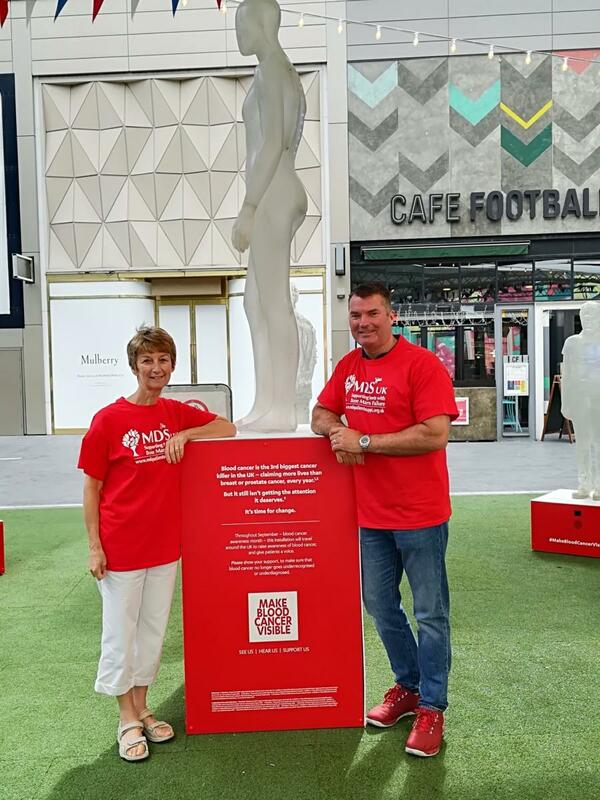 The Make Blood Cancer Visible campaign is something that is really important to me as hopefully it will bring more attention to the condition, drive more support and research and ultimately lead to there being other cures developed.